Continuing our commitment to preserve the memory of the events of 9/11, we present the account of Ryan Yantis, who was at the Pentagon when American Airlines 77 hit the building and then took part in the rescue operations. We wish to thank Ryan Yantis for his kindness and willingness to share his experience. Undicisettembre: What do you recall of 9/11? Can you give us an account of what you saw and experienced on that day? Ryan Yantis: I was a United Stated Army major and I was assigned as media spokesman, leading a team of spokesmen for the Army. We handled personnel and human resources questions and we would answer questions about “don’t ask, don’t tell” or Army weight policy, or women in the Army, investigations, courts martial and so on. My office was at the second floor, E Ring - the outer ring of the Pentagon - off of corridor 6, room 36. That means that the address was 2E636, which tells you where to go in the Pentagon if you wanted to go to my office. E ring is also where the generals and important people had their offices. On 9/11 I was coming out of a morning meeting where we were talking about a normal day-to-day plans, when we saw the first reports of the World Trade Center being struck. The initial reports was that it was a commuter aircraft, we didn’t know what had happened, but it was pretty bad. In the next 15 minutes or so I made calls to my colleagues in New York City, at Fort Drum, which is north of New York City, and Fort Dix, in New Jersey, because at that time many soldiers were just coming to work and I wanted to make sure they were awake and aware. My assignment before the Pentagon was New York City so I knew a lot of people in New York City. At 9:03 I was in our office watching a big screen TV with coverage of the World Trade Center on fire, watching the tragedy. At that point we thought it was just an accident until we saw the second plane hit World Trade Center Two. When the second plane hit it was clear it was a deliberate act. There were maybe twelve people in our group watching TV, all spokesmen, men and women, uniformed and civilians. I remember looking at a young lady who was working on my team, Elaine, who was nine months pregnant. I said “Elaine, I want you to get your stuff and go home. I want you out of here.” She argued quickly she said “No, you are going to be busy, we are going to get slammed today, we are going to have lots of media attention; you are going to need me.” I said “Elaine, I want you out of here. We’re next.” In my mind we were a “signature target”, we were a visible symbol of American and western power and might. And the Pentagon is an iconic building. Elaine refused to leave; I didn’t know that at the time, she made out fine. I recently wrote her son Andrew a letter and sent him an American flag. He’s the youngest Pentagon survivor I know, and I wanted him to know what his mom did on that day and the months after. I told other people “Hey get up off your butts, don’t feel sorry for yourself because we got things to do, let’s get busy.” because I was in a leadership position. Little while later a Lieutenant Colonel, the next higher rank, a gentleman named Henry Huntley, who was new to our team, said “Ok, Ryan, you are the one who worked in New York City, come with me we are going to a meeting. If New York asks for help we need to be ready to send them help.” And that’s true, as American military if we are asked or invited to come and provide support we can do so, but we can’t just push our way in unless the President declares a federal emergency. Henry and I were walking on the E ring, second floor, from Corridor 6 going to Corridors 5 and 4. The meeting was supposed to start at 9:30 in a conference room off of Corridor 4. I asked Lieutenant Colonel Huntley “Sir, where are we going? Where’s the meeting?” and he said “Corridor 4, in a conference room.” I said “Great sir, that’s the new wedge, it’s got a new floor plan, a new layout; what’s the address?” he said “I don’t know, it’s a conference room. We’ll find it.” I said “Sir, five floors and five rings, what’s the conference room? Who’s hosting this? We are late now, let’s go call and find out for sure.” He did not know the answers to my questions. So I walked off and he followed me. We made a call and we made it to where the meeting was going to be held off Corridor 7. As we walked in in that location, there was a security desk with a sergeant and he said “Gentlemen, you need to evacuate, there has been an explosion.” And the alarms started blaring. I remember asking “Sergeant, where is the explosion?” and he said “By the helipad between Corridors 4 and 5.” - where Henry and I were arguing moments before was basically in the impact area. If I hadn’t been stubborn and wanting to know where the meeting was, we would have been wandering around and possibly badly injured or killed. Because that’s where the bulk of the folks who died were located. After the announcement I went back up to my offices, made sure that my people had been evacuated, that nobody was there or trapped. I remember grabbing my cellphone from my desk. In our offices the lights were on, the phones were ringing off the hook, and at the same time there was this haze of smoke coming down from the ceiling. I cleared our offices and I went down the E Ring from Corridor 6 towards the corner and Corridor 5. 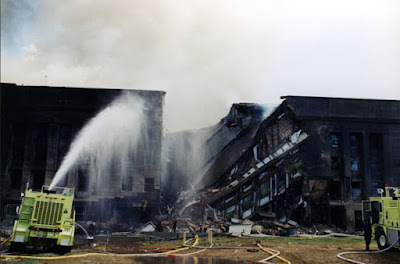 I hadn’t got to the corner of the building and the smoke got much heavier and I thought “Ok, it’s time for me to get out.” I had a three and a half year old daughter and a ten month old daughter and I was not equipped or suited up to go into a fire. That was a tough decision, because I felt like I was leaving people who needed help, worried for my own safety. I went out of Corridor 6 entrance and walked to our rally point where we would gather after a fire drill or an evacuation. I found some personnel from our office, we got together and I got the sergeant major, a senior non-commissioned officer, check my name off a list meaning he had seen that I was alive. Then he pointed out we were missing a number of people. I volunteered to go over the Corridor 8, which is the main north entrance into the Pentagon and is adjacent to the North Parking lot. I ran over there and that’s where I found stretchers that somebody had put out in the shade of a tree, opened up and ready. I saw people carrying what looked to be a bag out of the Pentagon, and I realized somebody got injured and they improvised a stretcher. The one I was standing by would help more than an improvised stretcher, so I grabbed it, ran and started helping carry people out of the building. That’s what I did for the next thirty minutes or so. We had what seemed to be a lot of injured people coming out of the Pentagon through Corridor 8. Also in Corridor 8 there was the Di Lorenzo clinic, which was an in-house medical facility where there could be physicals and minor medical procedures, and they had a staff there. The Pentagon is like a self-contained city of twenty-three to thirty thousand folks; eighteen thousand uniforms, and the rest civilians. 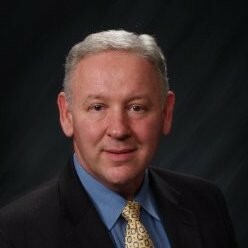 You have to have some in-house capability for medical appointments and emergencies. On 9/11 there were an estimated twenty three thousand people there. The medical folks were great, they were providing first aid and care and triage to those who were injured. I recall seeing men helping carry an improvised stretcher to a helipad where there was a helicopter setting down from a local hospital. There was a lot of running back and forth in and out of the building, carrying people, going in and getting more medical supplies. It was hot, with warm temperatures in the 80s; sunny and the air was thick with smoke. You could smell it everywhere, and it was not a pleasant smell. It was the heavy industrial jet fuel and plastic burning smell. There was a couple hundred people doing what I was doing, nobody was ordering us around. Just good men and women doing what needed to be done to help other folks. At a certain point the security guards were waving their arms and yelling at us to get back because there was another plane inbound. We heard a loud “boom”, which caused some confusion but that was the part of the Pentagon collapsing at about 10:15. We also heard sonic booms which some thought was a bomb blowing up at the State Department but turned out to be jet aircraft flying unseen above us. There were rumors that there was a truck bomb at the State Department, but we could see to downtown DC and there was no plume of smoke. There were a lot of rumors. I recall walking toward the Corridor 8 entrance – as I was tired from all the running and carrying I had been doing. I was with another officer, about fifty feet from the Corridor 8 entrance when the Security personnel started yelling at us to “GET BACK and RUN!” I could hear a jet approaching from behind me from the north low and fast. I was too close to the Pentagon to run anywhere and before I could really react, a US Air Force jet fighter flew by – low and fast – over the Pentagon heading south. I was very happy to see the jets because it meant we had air support. That somebody was watching out for us. We took this as “Well, it’s all clear” and we went into the inner 5-acre inner courtyard of the Pentagon. We set up into teams. I was on one of those carrying a stretcher, aid and litter, search and rescue team to go look for victims, and then the medical personnel set up a triage point for treating anyone we got out. From then until 15:45 we were in the smoke-filled courtyard playing a waiting game. The fire was too hot and the smoke too thick for us to go in. Around 3:30 pm they told us to pack up and brought us out through one of the other corridors, corridor 10. We walked around to the side that had been hit. 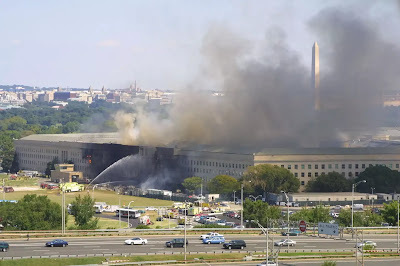 That was when I saw for the first time that that side of the Pentagon had collapsed and the fire was vastly smaller than when I had seen it at about 9:30 am. The last think I did was I had to make sure I could get my car keys and my wallet which were in my desk, which was behind the crime scene. I had to sneak my way in and I got things for everybody in my office which they needed to get home. I got told “Go home and get some sleep, get back here first thing tomorrow” because I was designated as essential staff member during an emergency. Undicisettembre: While you were there at the Pentagon was anyone having doubts about the fact that a plane had hit the Pentagon? Ryan Yantis: On September 12th I got up at about four in the morning after about four hours of sleep, put on my camouflage uniform, BDUs or Battle Dress Utility uniform, and drove back to the Pentagon. The streets were deserted, it took me about twentyfive minutes to drive up there. I got to the Pentagon before the sun came up and from the freeway, I-395, I could see that the west side of the Pentagon was still on fire. The central part around Corridor 3 was without power so it was black. Corridor 2 entrance was brightly lit. As I pulled off the interstate to park, the Military Police told me that the South Parking lot was closed and I needed to park elsewhere and walk in. So I parked a quarter of a mile away and walked in. Underneath the freeway there’s a pedestrian passageway, a viaduct, that opens up into South Parking. From there I could see on ground level the Pentagon. It was still on fire and there were water hoses spraying water on the fires. I walked through this abandoned parking lot of some two thousand parking slots towards the Pentagon. Maybe twenty or thirty cars were scattered here and there, and I had the realization that those cars likely belong to somebody who was injured or died in the attack. As I was crossing this parking lot out of the darkness in front of me, behind me, beside me were men and women. They were in combat uniforms, or flight suits, or jeans and sports coats and work boots for the civilians. We were all walking calmly and quietly across the empty South Parking to the building. When we got to the Corridor 2 entrance, there was heavy security. There Military Police (MPs) and the Pentagon police force had bomb dogs, they were stopping people to check IDs and sniff bags. And before we were allowed to climb the stairs to Corridor 2 entrance we all had to show identification. As we went up there were other security checks, at the top of the stairs people formed in a line to go through a magnetometer for weapons and having their bags checked again. All this to go into a building that was still on fire, without power in parts of it, to go to work. It was impressive and humbling, and I’m incredibly proud of them because no one was barking order or forcing them: this was expected and this they were doing. Undicisettembre: How long did it take before the situation at the Pentagon got back to normalcy? Ryan Yantis: There was a little more normalcy every day. On September 13th we had to set up hotlines for people to call in and report in that they were okay. They could call and say “This is my social security number, here’s who I am assigned to, I’m fine.” and then later people would be asked to show up with their ID to make sure they were who they said they were and not imposters because there’s always that chance, or someone who tries to fake a death so that they get insurance money. We also had to set up lines for families and others concerned to find out about who was missing. Where the plane hit was Wedge 1, a “new” wedge which had just finished renovating which had sprinklers and life safety features, into Wedge 2 which was 1940’s and 50’s construction. We had started repopulating that new Wedge and moving people out of Wedge 2 in anticipation to that wedge being renovated next. So these two wedges where the plane hit was the best place they could have, if they had it off of Corridor 8 or towards Corridor 2 they would have hit fully manned areas. “Normalcy” took weeks and months to get back to. I was there every day, but we had military and civilians who didn’t come back until a week or ten days later. Their “Day One” back in the building might be my day eleven for example. I had already processed beyond them, the Pentagon chaplains and behavioral health came and visited with people and helped them process through anger, grief and guilt, because the “Why them? Why not me?” was a common thought. For the Pentagon survivors there was never a day when it was “normal” anymore, it was like “that was then, and this is here and now”. Undicisettembre: How is working in the Pentagon today different from before 9/11? Ryan Yantis: I left the Pentagon for good in 2003 and moved to Chicago. While I was still technically assigned to the Army Staff in the Pentagon with duty in Chicago, day after day I would talk to people in the Pentagon and I also had a lot of friends and contacts there. People I worked with were very kind to me. They thought that I demonstrated care and concern for others, and that I was more focused on them than I was on myself on September 11th and days and weeks afterward, because that’s what I expect a leader to do. We are a fairly tight group. We stay in touch through social networks, we tend to follow each other. We are survivors. Ryan Yantis: I do public speaking about my 9/11 experience, and I work with World Trade Center survivors and others. I know what I saw and I know what I’ve seen about the Pentagon, and the limited amount of security footage. The explosion is consistent with a plane hitting the building and a jet fuel explosion: a large red fireball followed by the thick black smoke. It was not black smoke followed by a fireball, which is more like an explosive, such as a cruise missile or a bomb. Plus the impact was into the building and then spread, leading to the collapse. Had it been an explosive device or bomb, it would rupture and collapse the building right away instead of the time that it took. When I deal with conspiracy theorists I want to find out what their rationale is. Do they think it was the US government? Do they think it was Mossad? Did the Jews get told to stay home from work that day because it was an Israeli plot? These folks and the conspiracy theories have some other alternative narrative and don’t want to believe their own eyes. They are ignoring the reality and replacing it with some other more easily digestible crap that makes them feel better or lets them sleep at night. The conspiracy theorists push forward an agenda that is false to support something they believe in, which is often not true or supportable. Ryan Yantis: When I moved to Chicago I was used to being around a bunch of other 9/11 survivors every day at the Pentagon. When scuba diving and your body normalizes at being twenty meters underwater, if you come up too fast from that depth you get nitrogen bubbles that form in your blood. That can cause a physical condition called the “Bends”. When I got here in Chicago people knew I was from the Pentagon and someone would say “You were in the Pentagon, what was that like?” I didn’t have words and I was more emotional about it than I should have been. But I was very proud of the people I served with and what they did. In a way I was proud of what I did but I was also ashamed because it happened on my watch and I felt responsible. When people would ask me “Would you come and talk to my school?” I would try, but it was very difficult. I tried to step away from being the Pentagon survivor but I then realized it was like being tall or short: you are what you are. Own it and make yourself better at talking about it. I got involved in raising money for the Pentagon Memorial Fund, which was important to me, and I also got to meet with World Trade Center survivors and victim families. That was very healthy and healing for me. Many World Trade Center survivors here in Chicago were in New York only for a business trip – say a week of work - and they happened up being in the wrong place at the wrong time and almost died. They needed to process and talk about what they had been through, and I was able to talk to them and help them, and that helped me. Earlier today I was at a business meeting. There I made sure to say “I’m a Pentagon survivor. If you have a question, ask it.” because I don’t want to be surprised. If I try not to think about it and someone asks me a question and I’m not ready I don’t like being surprised and emotional. Undicisettembre: What do you think of security in the US today? Is the nation safer than in 2001? Ryan Yantis: Short answer is I think we are safer, as there hasn’t been a 9/11 style attack in 17 years. But at the same time we have a significant challenge with unstable people getting access to firearms. These people should never have firearms but they have them and use them to kill innocent women and children. The big challenge for us is to maintain individual liberties and freedoms while protecting the population. Some of the steps the government has taken for airport security are more annoying than realistic or effective. I understand and I would much rather take off my shoes and let them x-ray my laptop instead of having a shoe-bomb in the plane. That’s scary stuff.